We bought a house! It's in Round Rock, Texas and it is the house we were in a bidding war on. I didn't expect to get that one but we did and we are thrilled! Now we have to press forward with getting our house in Minnesota ready for sale. Today I have men working on cement work at the front of my house. They are replacing our sidewalk, and the driveway apron. My neighbor is prepping my deck to paint it. I am home alone and feel kind of vulnerable. KWIM? All of this is needed to get our house up for sale but it feels weird. Like I'm trapped in my own home. Oh well. I'm going about my business - working out, de-cluttering my closet, etc. The move is getting closer. In the meantime I have a card I have been meaning to share with you for awhile. We made this card in stamp club in early May. 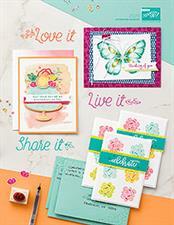 I am so very excited to share with you that Stampin' Up! 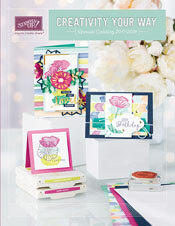 will be carrying alcohol markers in the new catalog that comes out June 1!!! I have been waiting years for these. Alcohol markers go on smooth with no marker lines and give you vibrant color on your line images. I just received my sneak peek markers today and they did not disappoint! Here is a quick card that I made with them. I used the Old Olive, Coastal Cabana, Neutral and Daffodil Delight alcohol markers. They come in 3 tones so you can get shading and different tones of the same color. They are very user friendly and so much fun to color with! I can't wait to try them out on other line images. Let me know if you have questions about the markers. They will be available to purchase in the new catalog on June 1. Today's card is a CASE from a card made by Vicki of It's a Stamp Thing. We made this in March's stamp club. The papers and the color combination are from the Fresh Prints paper stack. Love this paper! My last day of work is tomorrow. Unreal. My co-workers surprised me on Friday with a potluck lunch, card, and Home Depot gift card. They know how much we are spending there lately! I work in a unique environment of about 12 women and the owner, Jeff. We are all pretty close in age with kids not too apart in age. I like everyone I work with and I will miss them. But I really need to be done with work and concentrate on decluttering and cleaning our house! We had a realtor stop by on Sunday to evaluate what we still need to do to our house to put it up for sale. As much decluttering as I have done I still need to do a TON more! This is going to be my full-time job when I'm done with work. But first I am having my annual Stamp and Scrap Sale on Friday and Saturday. I will post more information about that in a day or two. Yoo hoo! Is anybody out there? I wouldn't blame you if you weren't. I have been absent from my blog. I just haven't had the time for it. My husband and I have been working on getting our house ready for sale. Working full-time doesn't allow for a lot of time and energy to devote to it. Last weekend I spent 10 hours in my craft room decluttering and pulling things aside for my big annual stamp and scrap sale. This is the best my craft room has looked since my husband built it. I got ruthless with my stuff and pulled out stuff that I think is still cute but haven't used in years. I mean I Love cupcakes but how many stickers and embellishments do I need of them? There are only so many scrapbook pages I can make with them. I am still going with my card stamp club and my Recipe club. I'm grateful to have these ladies in my life and an outlet for my creativity during this crazy time. I want to share with you a file folder card we made in stamp club in March. The card is so easy and was a big hit with my stamp club ladies! Here is video tutorial by Patty Bennett of the File folder card. Did you watch the Superbowl? I didn't. I only saw the score at the end. My family and I were out to dinner at P.F. Changs for my daughter's 20th birthday celebration. I now have one less teenager. I will probably watch the half-time entertainment and some of the commercials on Youtube. For me, that's the good stuff. Monday mornings are never fun, right? We started something at work, about a year ago, that has helped. I work in a small office of about 12 people. We take turns bringing lunch in for everyone on Mondays. In the Winter it's something in the crockpot, and the in Spring/Summer it's usually a salad of some sort. One less thing to have to figure out on Mondays, unless of course it's my turn to bring in lunch! This card features a stamp set called, Baby We've Grown, from the Occasions catalog. I stamped it on watercolor paper and colored it in with markers and the aquapainter. The designer paper is the Etcera paper from the main catalog. Crazy weather around the country this week. I know some of you in warmer states had snow, ice and colder weather than you are accustomed to. Here in Minnesota we have had more cold days than we usually get. My kids finally went back to school yesterday. Their schools were closed Monday and Tuesday due to the dangerously below zero temps of 16 and 20 below. We have something here called wind chill that brings the temps down to feeling like 40 below. This isn't weather anyone enjoys. I hope everyone is safe and warm and the kiddos are back in school! We are celebrating my daughter's 20th birthday this weekend. I'm stumped on what to get her this year. I'd like to surprise her but I'm sure there are plenty of things she needs/wants because she is a poor college student(I have to keep reminding her of that sometimes).